Boxes are hot! This pattern is perfect for any collection of fat quarters. 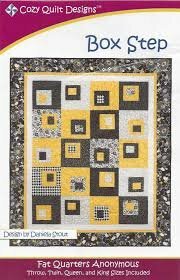 One background fabric (yellow in our sample) makes the pattern come alive and the randomness of the squares add that contemporary touch.